A bright Vein Light shows feeding veins under the surface that are closed with an FDA-approved medication allowing visible veins to lighten. Treatments take under 40 minutes and you can return to work and normal daily activities right away. 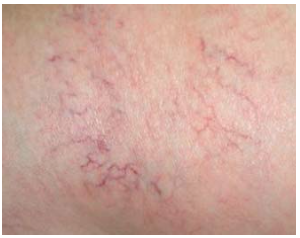 Most patients experience improved symptoms and possible lightening of the visible veins over the course of their injections. The ultrasound shows mid-sized veins below the surface of the skin. The veins are closed with an FDA approved medication. Treatments take under an hour and you can return to work and normal daily activities right away. 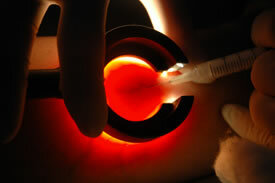 Some patients require injections of deeper veins in the leg and thigh that are branches or tributaries. Other patients have the untreated ankle portion of the Great Saphenous or Small Saphenous Veins that require injection after the laser has successfully treated the rest.